Polar is a 2019 neo-noir action film based on the webcomic series of the same name. It is directed by Jonas Åkerlund and written by Jayson Rothwell. The film stars Mads Mikkelsen, Vanessa Hudgens, Katheryn Winnick and Matt Lucas. It was released on January 25, 2019, streaming on Netflix. Recently retired assassin Michael Green is killed at his home in Chile by a team of his former comrades from the Damocles corporation, a private security firm. Damocles is deep in debt; the head of the company, Mr. Blut, has schemed to repay his creditors by killing off several of his assassins right as they reach the mandatory retirement age of fifty, allowing him to take back the millions of dollars in their pension accounts. 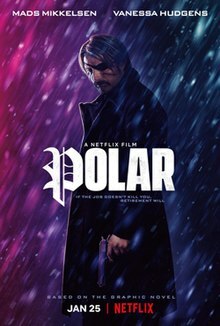 Polar is a 2019 neo-noir action film based on the webcomic series of the same name. It is directed by Jonas Åkerlund and written by Jayson Rothwell. The film stars Mads Mikkelsen, Vanessa Hudgens, Katheryn Winnick and Matt Lucas. It was released on January 25, 2019, streaming on Netflix. Recently retired assassin Michael Green is killed at his home in Chile by a team of his former comrades from the Damocles corporation, a private security firm. Damocles is deep in debt; the head of the company, Mr. Blut, has schemed to repay his creditors by killing off several of his assassins right as they reach the mandatory retirement age of fifty, allowing him to take back the millions of dollars in their pension accounts. Duncan Vizla, another Damocles assassin, is preparing to retire, which will entitle him to an $8 million pension. He is contacted by his handler, Vivian, who says Blut wants him to travel to Belarus to kill a hitman allegedly responsible for the murder of Michael Green. Duncan declines. Having left behind a false trail, he disappears to the small town of Triple Oak, Montana, where he intends to settle into a quiet retirement at a lakeside cabin. But Duncan is haunted by recurring nightmares from his time as one of the world's premier killers-for-hire — in particular, a botched hit in which he ambushed a car carrying a family. Duncan has one neighbor, a young woman named Camille, whom he notices one day struggling to chop firewood. While she is out for the day, he cuts and piles her wood. The next day, while shopping at the town’s general store, he sees the woman again, and the cashier introduces them. Vivian again reaches out to Duncan, doubling the price for the revenge assassination in Belarus. He travels to Minsk to do the job but discovers that the mission is really a trap laid by Damocles to kill him. With Duncan now onto him, Blut sends out the same hit squad that killed Green. Camille is shy and easily frightened, but Duncan takes a liking to her, and they eventually bond. She encourages him to get involved in the town, and he, having observed how jumpy she is, encourages her to learn to shoot a gun and offers a sympathetic ear when she opens up about trauma in her past. Though Duncan had covered his tracks well, the assassins eventually track him to Triple Oak through large donations he made to a charity set up at a bank there. They ambush him at home, but he turns the tables and kills them one by one. Even so, Damocles operatives kidnap Camille, looking to use her as bait to draw him into the open. Duncan travels to Detroit to get information from a former mentor, Porter, but Porter betrays him and turns him over to Damocles. Duncan endures three days of torture at Blut's hands before escaping. He makes his way to an old lover, Jazmin, who tends to his wounds and supplies him with weaponry. Offering to trade himself for Camille, Duncan lures Vivian and dozens of Damocles mercenaries to a remote location, where he slaughters them with Jazmin's remote-controlled machine guns. Blut's remaining men desert him, and Duncan arrives at Damocles headquarters, where he kills Blut. Duncan finds Camille heavily drugged and brings her back to her home in Montana to nurse her back to health. One morning, he finds papers in her room — check stubs from his own charitable donations and newspaper clippings about the botched assassination that has haunted him for years. Camille reveals that she was the child Duncan had spared that day — the only member of the family to survive — and that she had been receiving the $200,000 a year he donated to a trust fund set up to care for that child. Much like the Damocles hit squad, she had tracked him down through the donations, and she knowingly rented the cabin near his. Duncan offers her the opportunity to kill him, but she cannot bring herself to do so. Instead, she asks him to help her track down who had put a hit out on her father, and he agrees. The film was first announced in October 2014 as a live action adaptation of Dark Horse Comics' Polar, developed by Dark Horse Entertainment and Constantin Film. A spec script for the film by Jayson Rothwell was purchased. In October 2017, Mads Mikkelsen signed on to star in the film. In February 2018, Vanessa Hudgens, Katheryn Winnick and Matt Lucas joined the cast with Netflix onboard to distribute the film. Filming began on February 23, 2018, with noted Scandinavian director Jonas Åkerlund at the helm, in Toronto, Canada. It was also filmed in Orono, Ontario. In September 2018, musician Deadmau5 announced that he was in the process of producing the film's original score. Netflix started streaming the film on January 25, 2019, with Deadmau5 releasing the soundtrack on the same day. Polar (Music from the Netflix Film), the film's soundtrack album, was released by Deadmau5 on January 25, 2019, through his record label Mau5trap. The soundtrack's release details were announced on January 8, 2019, along with the film's initial trailer. A single from the soundtrack album, "Midas Heel" was released on 11 January 2019, followed by the vocal version called "Drama Free" featuring Lights which was previously released on Mau5ville: Level 2. Several tracks of the score (such as "Somb", "Wilhelm" and "End") feature elements from Deadmau5's previous tracks from his seventh studio album While(1<2), as well as two new tracks named "Nosedive" and "Camilla", the former being a remake of his unreleased track "Rio", the latter being known previously as "Suite 02". On review aggregator Rotten Tomatoes, the film holds an approval rating of 24% based on 37 reviews, with a weighted average of 3.2/10. The website's critical consensus reads, "An action thriller starring Mads Mikkelsen as the world's most dangerous assassin should be terrifically entertaining, but Polar proves it's possible to ruin anything if you try." On Metacritic, the film has a weighted average score of 19 out of 100, based on 12 critics, indicating "universal dislike". ↑ Miska, Brad (December 18, 2018). "First Look at "Hannibal's" Mads Mikkelsen in Netflix's 'John Wick'-esque 'Polar'". Bloody Disgusting. 1 2 3 4 "Jonas Akerlund on Instagram". Instagram. Retrieved 2019-01-07. 1 2 3 4 "Polar (2019) Full Credits". IMDb. Retrieved 2019-01-07. ↑ "Graphic Novel 'Polar' Gets Film Adaptation from Dark Horse, Constantin". Variety. October 22, 2014. ↑ "Mads Mikkelsen to Star in Action-Thriller Movie 'Polar'". Variety. October 26, 2017. ↑ "Vanessa Hudgens, Katheryn Winnick & Matt Lucas Join Mads Mikkelsen In The Action-Thriller 'Polar'". Deadline. February 23, 2018. ↑ "Netflix and Constantin start production on Polar". Comingsoon.net. February 23, 2018. ↑ "Mads Mikkelsen is in Orono for filming of action thriller 'Polar'". kawarthaNOW. February 13, 2018. Retrieved September 19, 2018. ↑ "Goat Lord on Twitter: "well, the mouse is outta the bag,....working on my first film score for @constantinfilm @Netflix's #Polar..."". Twitter. September 18, 2018. ↑ "Polar Film Trailer Featuring The Music Of Deadmau5 Now Available". musicnewsnet.com. January 8, 2019. ↑ "Deadmau5 on His Scoring Debut for Netflix's 'Polar': 'I Wanted to Wait for the Right Thing'". Billboard. Retrieved 25 January 2019. ↑ "midas heel by deadmau5 on Spotify". Spotify. Retrieved 11 January 2019. ↑ "Polar (Music from the Netflix Film) by deadmau5 on iTunes". Apple Music. Retrieved 11 January 2019. ↑ "Polar (2019)". Rotten Tomatoes. Retrieved January 28, 2019.